cheney stadium, home to the now defunct tacoma tigers and current tacoma rainiers, once held a monster used car blowout extravaganza in their parking lot. 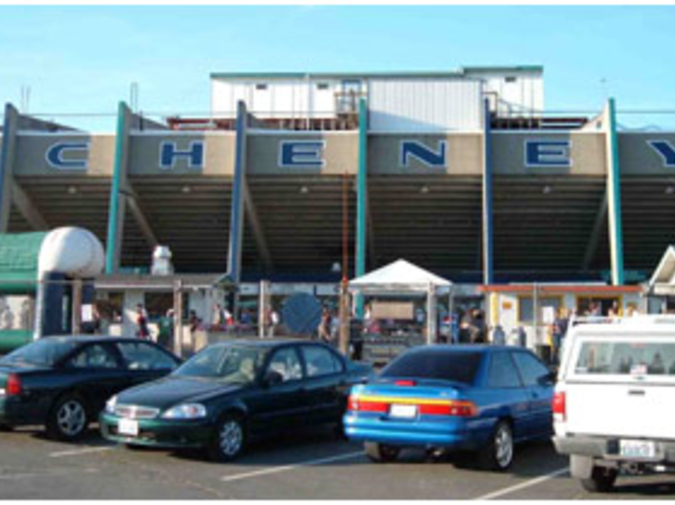 i was 17 and needed a cheap car, so i went, going more because it was at cheney stadium and because i had nothing better to do that day. i told myself that i was there to look, not talk, but look. check some prices, get excited about owning a car, maybe even sit in one if the door was unlocked. talking was out of the question. no salesmen. within 20 minutes i had seen all i needed to see, so i started to head back to the blue family van my mom let me borrow for the day. then i heard his voice. "hey there big guy! leaving so soon?" i turned around to see a salesman walking towards me so fast i felt like he was a romulan warbird approaching at warp speed. i was so close. "yeah. i was just looking," i said. he had now disengaged his warp drive and was within range. "my names anthony pringle. like the chip. what can i help you find today?" "nothing, man. i was just looking." i turned around and kept walking because i know enough about human-romulan relations to know that they dont get along very well. "well here, take my card. it says my name on it. anthony pringle. you wont forget that, right? so when you come back, you ask for the pringle. ask for me, anthony pringle." "like the chip?" i was being sarcastic. i took his card and put it in my pocket without looking at it. "yeah my man! like the chip! you wont forget that now, right?" ive tried to erase this name from my head, but i cant. its stuck there and its showing no signs of ever leaving. ever. i hate pringles, and i'll probably never be friends with anyone named anthony. and thats why you should never go to used car sales in minor league ballparks.